Bookish Bloggers Unite was formed when a group of like-minded writers decided they wanted to talk about books together. We hope you’ll join us! This is the first week, so it’s only natural that our topic this week is introductions. Katy answers the full list of questions on her blog; I’ve selected some of them to answer myself. Who/What got you into reading? I’ve been reading as long as I can remember. 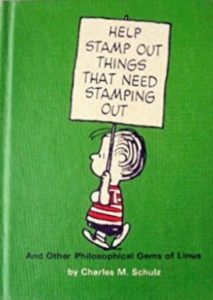 One of my earliest memories is of sitting in our basement, reading a tiny little book of Peanuts comics. My parents were (are) both readers, and our house was full of books of all kinds. There’s a photo of me as a toddler, sitting on the floor, “reading” a copy of Ringer’s Winning Through Intimidation. I also happen to have a washcloth on my head, proving that I have always loved books and always had questionable fashion sense. Historical fiction, mystery, and some fantasy. I’ve been on a cozy mystery kick of late. I used to be slightly obsessed with Arthurian-inspired tales. And, of course, I’m completely obsessed with Sherlock Holmes. On the non-fiction side, I enjoy memoir, social science, and history, especially the Heroic Age of Antarctic Exploration. What are your least favorite genres? As a teen, I was really into horror, but I’ve found that as an adult (and particularly since becoming a parent), I just can’t read it anymore. The big-name thriller novels are also generally out for me. I like my mysteries cozy, historical, and/or “soft-boiled”, as I once heard them described. If you had to choose between bringing a mediocre book series or one great standalone book to a deserted island, which would you pick? One great stand-alone, please. Something I can read again and again and keep finding interesting things to think about. How do you organize your bookshelves? Do you even have any organizational system? My books are loosely organized by subject, and sometimes then organized by author. My knitting/crochet/spinning books are all together and usually alphabetized. I have a small(-ish) bookcase that is all Sherlock Holmes books, with scholarship and pastiches in their own sections, plus another shelf with books about Arthur Conan Doyle and Victorian England, and a small shelf of Holmes adaptations/pastiches in graphic novel format. When I have a lot of books by one author, I put them together and organize them by title. What’s the next book on your TBR that you’re excited about? Strange the Dreamer, by Laini Taylor – I heard about this a while back, thought it sounded interesting, and then kind of forgot about it until it was named a Printz Honor book. Have you ever gone to any book signings? Which was your favorite? I’ve been to several signings for Neil Gaiman, including one at ALA Annual Conference first thing in the morning the day after the Newbery/Caldecott Award Dinner in 2009. He was scheduled to sign at the publisher’s booth at 9am, when the Exhibits Hall opened for the day. Around 8:30, one of the HarperCollins employees brought out signs for the beginning and end of the line that was by then quite long. 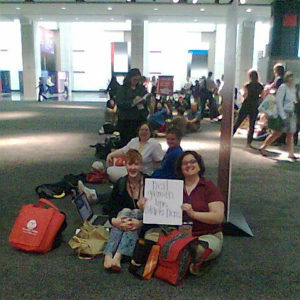 The one I’m holding says, “Neil Gaiman line starts here”. He signed it for me (along with my book); it has been under the glass top on my desk ever since. 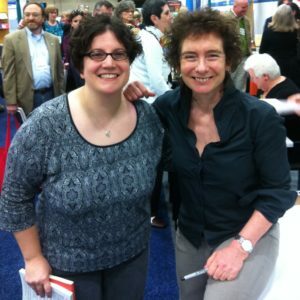 Another ALA signing with a special place in my heart was in 2012, when Jeanette Winterson was in the Exhibit Hall signing ARCs of her memoir, Why Be Happy When You Could Be Normal? Her first book, Oranges are not the Only Fruit, is one of my absolute all-time favorite books. Of course, I didn’t manage to bring my beloved original copy with me to the conference, so I had to buy a new copy there. (Yes, “had to”.) Which is why I now have two copies of Oranges (I used to have three, actually – my original copy, a second copy I picked up at my local used bookshop, and the copy I bought that day and had signed) and two copies of Why Be Normal (the signed ARC and the hardback that I got as soon as it published). Hardcovers or Paperbacks or eBooks or Audiobooks? Yes, please! I will have all the books, thanks. I love a nice hardback book, but library ebooks might be stealing my heart. What is the ideal reading day for you look like? What book are you most excited about in 2018? 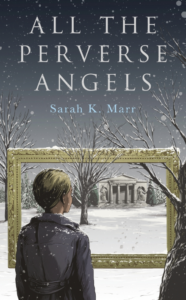 All the Perverse Angels, by Sarah Marr, which released yesterday! I got to read the book when it was still in manuscript. I’m so excited that it’s finally out in the world! This is a beautiful book about love and loss and art and feelings and stories. It is powerful and smart and original, and you should read it. Now, I’m off to read some more #BookishBloggersUnite via the link-up in Katy’s post. I loved Strange the Dreamer. I only recently started getting into Sherlock Holmes, and I am slowly making my way through the collection in Audible with Stephen Fry narrating in my ears. I’ve heard that is an excellent recording! I’m holding out to see if the US edition gets the Casebook added to it once all of the stories roll into public domain. I love cosy mysteries too!